The industry I work in can sometimes run you ragged. There are definitely many days that a lot of us work well more than 8 hours. And there are lots of days when we hate people in other departments. So in an effort to build some community between some of the departments that get left out sometimes (so, basically, not the sales people... lol) my boss and the director of the other departments banded together and sent us an invite to have a day off work to spend a few hours bonding. And not the kumbayah kind of crap either. No trust falls or sharing your feelings in a circle. 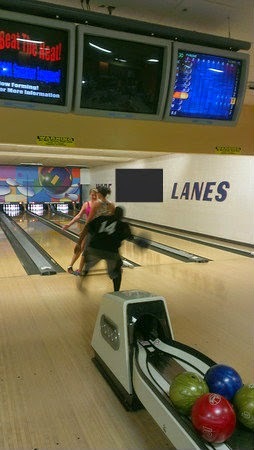 So we switched it up - and headed bowling! 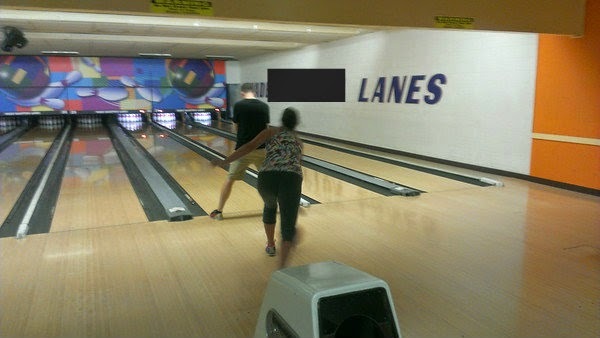 Yes... that's us bowling between people's legs. We're all kinds of crazy around here! We played one round normally, then bowled a round of "tricks" and then headed downtown for some lunch and cold beverages. I really, genuinely like the group of people who were out with me that day. It's so nice to throw on some normal clothes and hang out without the bosses looming over us. Without going into too much detail on here, morale at work has been at an all-time low lately. There are some new people who are just literally draining all the fun (and incentives and community) straight out of each of us. I actually got on and looked at job postings a few times lately. Others are doing the same. We have a great team who enjoy what we do, but not at the loss of time with our family and friends. Not at the loss of recognition and advancement. Not at the cost of losing our souls... because it has become soul-sucking some days. Puff and I are unsure about a lot of big picture things right now - moving vs. remodeling, having a second baby, etc. So the timing is pretty crappy for me to have to be looking for another job. So, we'll see how it goes. For now, I'm sucking it up, and holding on hope that things will take an upswing. And fast! I'll just hang on to the memories of little things (like this outing) and know that I'm not alone. I've got an awesome team. What a fun day! It's great when companies plan stuff like that for their employees! I'm sorry things are so sucky right now! Here's hoping they turn around for the better soon!